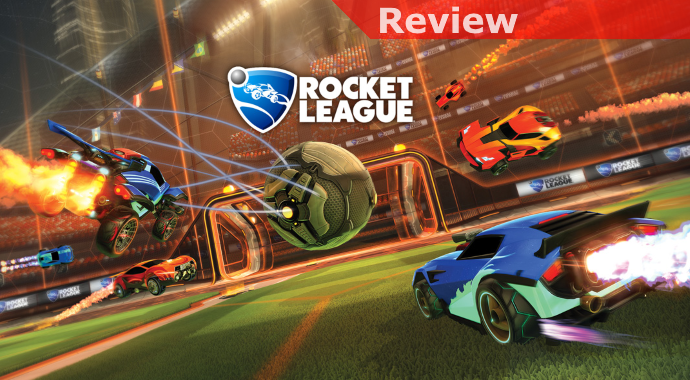 Rocket League is a completely oddball concept that I don’t think would have ever been created by a AAA game studio. When trying to describe it to people what you roughly end up having to say is, “It’s like playing soccer with rocket-powered cars,” and as the words escape your mouth they feel a bit odd. The thing is, at its base, that is roughly what the game involves but it is also so much more than that for people who’ve gotten the bug for it. It’s also about last-second goals sending the game to overtime, improbable saves made by someone streaking across the goal just before the ball goes in, and people making aerial goals that defy gravity. Once it finally clicks and you make one of those crazy plays yourself it’s a rush that’s hard to turn your back on. The majority of people tend to play in the standard modes, either competitively or just for fun, in 1 v 1, 2 v 2, and 3 v 3 matches. These are just for the standard game with normal rules and depending on how many people you have the dynamics of the game shift quite a bit. In 3 v 3 the tendency will be to have 2 people generally playing offense and 1 person ideally hanging back to cover to the goal. 2 v 2 tends to be a bit more fluid with players needing to balance the risk and reward of the second player coming up to help on offense while leaving the goal open. 1 v 1 is just what it sounds like with 2 players facing off and trying to prove who has the better core skills (or luck). In addition there are a load of casual-only modes including the jam-packed 4 v 4 Chaos, Hoops (which is a bit like basketball and challenging), Snow Day (which has a puck and is like ice hockey), Rumble (full of crazy power-ups and can be quite unpredictable), Drop Shot (the arena floor takes damage to eventually open up and become the goal, very strategic and challenging), and Rocket Labs (featuring a variety of non-traditional arenas). In short, whether you’re looking for something light and silly or more intense there’s something for all tastes. If you decide to take the plunge there are a number of things you’ll want to do and understand in order to best enjoy your experience. First, you’ll want to absolutely use the game’s Training modes and get a fundamental understanding of how to play from a mechanical standpoint. Knowing how to move quickly and having a general feel for doing even simple moves while in the air are the foundations for both more advanced play and enjoying the game rather than being aggravated by it. 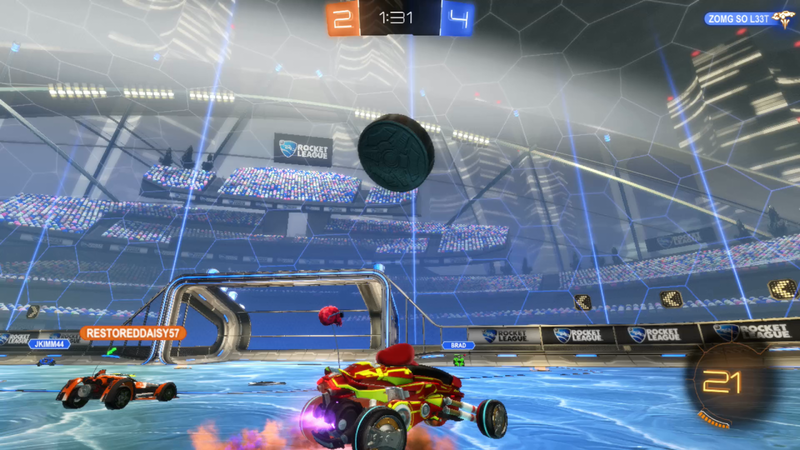 Next, though playing against bots is in no way a replacement for competing against humans, I’d suggest Playing Locally and setting up an Exhibition or Season, first maybe even just setting up a local lobby and playing by yourself to simply moving around the arena to get a feel for its dimensions. The reason this feel will be important is that while it is initially difficult you should learn to play the game primarily with the Ball Cam on, meaning you won’t be looking forward with an arrow trying to help you know where the ball is, you’ll always be looking at the ball. Positional awareness is vital in this game and while the arrow is helpful Rocket League is all about precision and trying to make tough plays when you don’t really know where the ball is makes for a lot of disappointment. Playing some matches offline against bots won’t give you everything you need to be prepared for human competitors but they’ll at least help you develop some core competency. 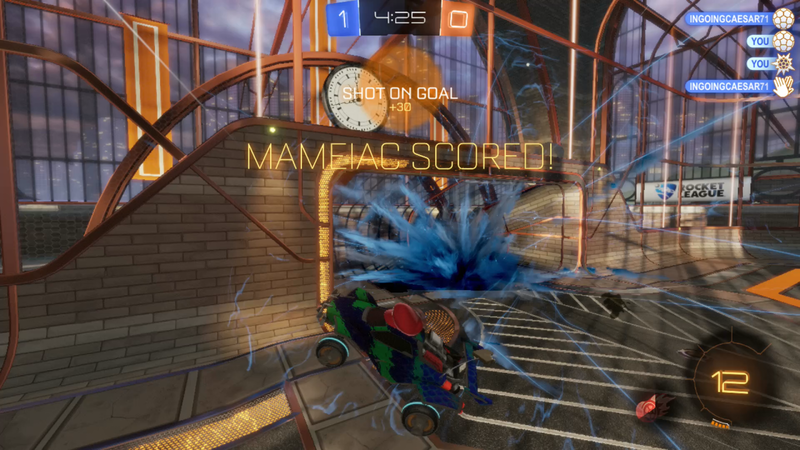 While, for the most part, the Rocket League community is pretty friendly there’s nothing worse than missing a block you should have made and getting “What a Save!” spammed at you. 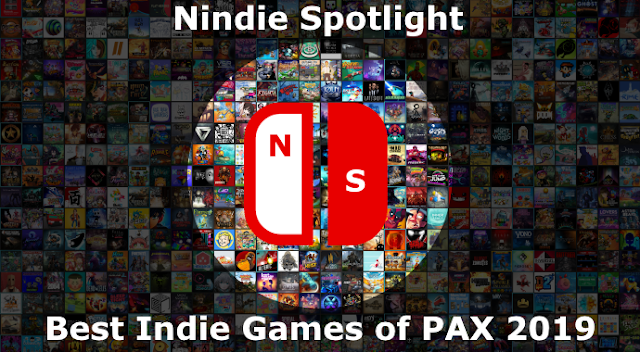 Now having gone over what the game is, why it can be a lot of fun, and how to get yourself started on some semblance of the road to success we get to the verdict on the Switch iteration of the game itself. As a 500+ hour veteran of playing it on the PC I will absolutely admit that my personal bar for the game is high, and no doubt that makes me more picky, but I’d say it is a mixed bag. Most critically the game is 100% playable, and that includes the vital ability to get in the air and make big plays with precision. If the game’s framerate weren’t consistently high this wouldn’t be possible so they’ve focused on what is most vital and made that happen. That gets us into what isn’t quite as good. Certainly the lower resolution in docked mode is hard to miss, the edges on everything are a bummer and some of the lighting can be odd at times. What this means is that in many ways playing it in handheld mode looks much better but that also has its limitations. Though not a technical fault one issue with playing it handheld is that interpreting the action at the far end of the field, a key element to playing goalkeeper in particular, is tricky simply given the size of the screen. While you can deal with this as an issue it just points out where the reduced screen size in handheld mode can be less than ideal. While the issues were sporadic, and I’d hope they’ll be patched out, I also occasionally got a performance stutter or hitch when action in my immediate area got intense, when a destruction happened close by, and with some combination of effects in Rumble Mode. None of them were so bad as to ruin the game, just I’m very sensitive to performance and I couldn’t help but notice them. As I’d suspected people’s concerns over the lack of analog triggers on the Switch were unfounded. Very honestly in a game where you have rocket boosting and try to keep your speed up at all times it isn’t much of a factor, and I didn’t have any issues performing any of my core aerial moves either because of the purely digital triggers. In the end Rocket League is absolutely one of my favorite games of all time and I’m thrilled to finally be able to play it on the Switch. While I’ve never enjoyed competitive multiplayer sports titles once I got the basic mechanics of the game down and had my first incredible goals and saves it hooked me completely. Playing against people better than you is often humbling but it is also instructive. So much in the game is about first understanding what is possible and then working to figure out how to do it yourself. That shot off the wall where they then boosted off to follow the ball to the goal? Someone had to think big and crazy and then practice to do it first. It’s exhilarating when you pull off great plays and in general I’d say the community of people you’ll play with and against is among the most polite, overall, I’ve ever interacted with. The great news is that Rocket League is absolutely playable and still that terrific game experience on the Nintendo Switch, I’m only sad that it isn’t quite good enough that I’d say if you have the option to play it on other platforms you won’t want or need to anymore.